LSU is No. 3 nationally in total rushing offense, averaging 346.4 yards a game on the ground. Coach Miles on JD Moore: I’d like to think he would be back after the bye week. We’re hopeful he’ll be back around that time. While running back Leonard Fournette is garnering much of the hype (and rightfully so), fullback JD Moore has been a big reason as to the success of LSU’s vaunted rushing attack. The former walk-on has not only opened up holes for Fournette consistently, but he’s been punishing people with his physical nature. Moore suffered a knee injury against South Carolina last weekend. As a result, he will be out for the next few weeks. LSU starting fullback JD Moore will miss the game vs. Florida (& maybe more) due to strained knee ligament, reports The Advocate. It will be fascinating to see how this development affects the ground-game. 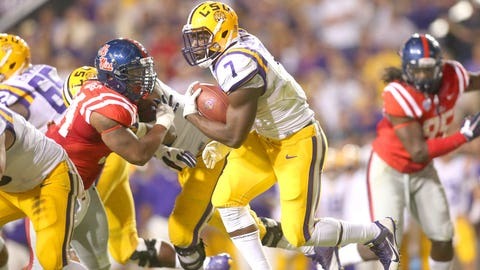 Fournette likely will still get his yards against a tough Florida defense, but it will be more difficult. Bry’Keithon Mouton looks primed to fill in for the injured Moore.